In today’s digital electronic world it’s rare to find recordings that are not highly processed, edited and even over-dubbed. All eleven pieces on the NEXUS Ragtime Concert LP (1976) were recorded using the direct-to-disc process – a method that required each full side to be performed in a single take. That’s six pieces in a row without a break and with no possibility of edits. An example from the record is my arrangement of Triplets, by G.H. Green. Green’s Charleston Capers is included on NEXUS Plays the Novelty Music of George Hamilton Green (1986), and also was done in one continuous take, as were a few other pieces on that CD. I always felt good when we recorded this kind of music in one take, because that was the way it had to be done by G.H. Green himself during the acoustic recording era when he was most prolific. The recording technology at the time (around 1915 through 1925) was entirely mechanical, using no electrical components or microphones – the original direct-to-disc method. My arrangement Girlfriends Medley from our CD Drumtalker (2003) was another one-take recording. Music like this, where continuous improvisation is a major part of the performance, kind of demands that approach. Although some extraneous noise and unintended sounds have to be left in the mix, the feeling of spontaneity in the music overrides all of that. In 2010 Japanese marimbist/xylophonist Yurika Kimura began a project to transcribe and arrange performances from some of G.H. Green’s old records. 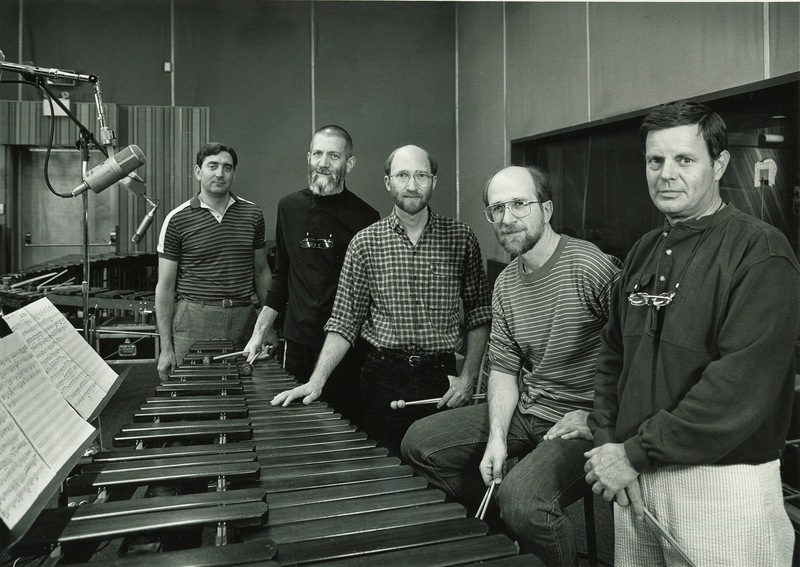 Although Green was accompanied by the great pianist Frank Banta, or by small ensembles (including the very famous All Star Trio), Yurika was able to arrange the accompaniments for marimba solo, played with four, five or six mallets. Yurika’s transcription-arrangements eventually were published by Keyboard Percussion Publications in 2013 as the Recollections of G.H. Green series. Later that year Yurika and I recorded all of her arrangements on the CD Alabama Moon, followed by a concert tour that included a showcase appearance at PASIC ’13 in Indianapolis. One of the pieces Yurika transcribed and arranged is Castle Valse Classique, a waltz-time version of Antonin Dvorák’s popular piano composition Humoresque (Op. 101, Number 7), composed in 1894, one year after Green’s birth. Green recorded the piece at least eight different times, and Yurika selected the performance on an Emerson cylinder to transcribe. Our recording, although not direct-to-disc, was made in a single take.